Does the idea of a large group of people give you heart palpitations? Are you overwhelmed at the idea of hosting a big, fat, Greek(or other culture) wedding? Or maybe you’re not thinking of a small beach wedding package out of fear or avoidance of a large crowd, but rather you just value an intimate occasion. Our small beach wedding packages range from 2-50+ people, so pull up a chair and let’s have some “small talk,” small beach wedding packages “talk,” that is! Small beach wedding packages are easier to plan due to the mere simplicity of them. Less invites, less managing people, less money spent on catering to guests. So less really is less in this case. With large weddings you are talking hotel room blocking, increased meal cost (night before or reception), more phone calls/emails with family members/friends to answer travel/lodging questions and increased general people management. So if you want a clear cut, stress free, wedding, a small beach wedding is just the ticket. When deciding your guest list, or lack there of, your first big decision is to decide if you are inviting any guests or are you eloping as a couple? The term Small Beach Wedding Packages may mean “party of two,” or maybe it’s just enough for a game of pick up basketball (that’s typically 10 people for all the non NBA fans). It’s a big decision to elope as a couple, especially if you come from a big family or large network of friends. So, the first thing is to ask yourself, “Is a beach elopement right for me?” However, remember “small” beach wedding does not have to mean elopement! You can buy an all inclusive beach elopement package, which allows 2-8 participants (bride, groom, plus up to 6 more) for less than $800. Now even a large wedding package with Florida Beach Weddings still qualifies as affordable, but the elopement packages price is the best way to pinch every penny. And when you are talking in relation to a traditional wedding venue and reception, the savings a beach wedding package will save you is in thousands of dollars. Often times with large weddings the guest list line get hazy when it comes to how far down the line you go. First and second cousins? Co-workers? College friends? New friends? Acquaintances? Small beach wedding packages may mean it’s just the two of you or just immediate family/bridal party only. With a small beach wedding package you don’t have to worry about hurting your long distance second cousin’s or work cubicle buddy’s feelings. The “if” invites of a large wedding are clear and definite “no’s” with a small beach wedding package. And you can always have an open invite celebratory party when you get back home from the wedding/honeymoon! Elopements– If total intimacy and zero guest list sounds like a dream come true, an elopement package is for you. An intimate, small wedding package with 2-35 guests is a great happy medium somewhere between elopement and large wedding. Party time– If you read this post and decided, “NO WAY small beach wedding!” Well then bring on the party and check out our affordable Florida Destiny Package which accommodates up to 50 guests. LOCATION- Once you’ve decided the size of your beach wedding. It’s time to narrow down your beach location. From east to west coast, north to south, Florida Beach Weddings has a beach for you! Whether you like the white sandy beaches and sunsets Siesta Beach, Clearwater Beach, and Destin Beach have to offer. 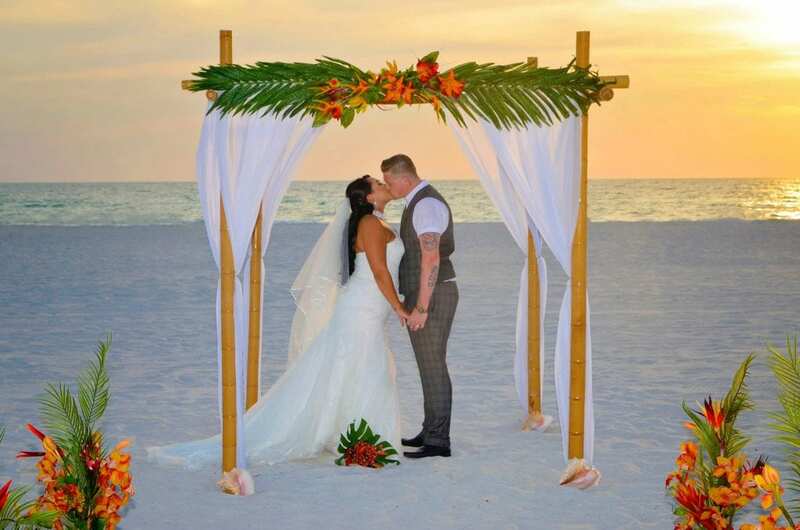 Or maybe it’s the peaceful beach scene mixed with hours of fun filled entertainment and historical sights on our St. Augustine Beach, Daytona Beach, Jacksonville Beach, Cocoa Beach, or Miami Beach, there is no doubt we can help you find your perfect beach wedding location! Check out exactly what an amazing beach wedding looks like! So whether you’ve decided small beach wedding package without a doubt, you’re on the fence, or you know it’s going to be a big beach bash, contact us to begin planning your dream beach wedding. Still have more beach wedding questions? Check out our FAQ page to see what other brides and grooms often think about when planning an affordable beach wedding.